New Association launched to provide a discussion forum about research and innovation in gene editiing technology. 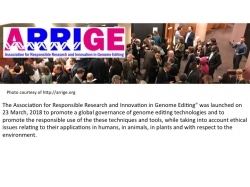 The Association for Responsible Research and Innovation in Genome Editing" was launched on 23 March, 2018 to promote a global governance of genome editing technologies, to promote the responsible use of the these techniques and tools, taking into account all associated ethics issues as well, in relation to their application to human beings, to animals, to plants and, in general, to the environment. Meeting in Paris were researchers, clinicians, lawyers, ethicists, including delegates from governmental agencies, companies, universities, global programs, Foundations, Academies, other scientific and non-scientific associations, research funding bodies, non-governmental organizations and patients groups, from all over the world, including the Global South. More than 35 countries were represented, including several countries from Africa, Asia and Central and South-America. A rich diversity of stake holders with a genuine interest in the responsible application of genome editing technologies participated. We are proud that several ISTT members attended the ARRIGE kick-off meeting. If anyone is interested, more information is available from the ARRIGE web site: http://arrige.org . Persons interested in joining the ARRIGE initiative should e-mail: join@arrige.org.